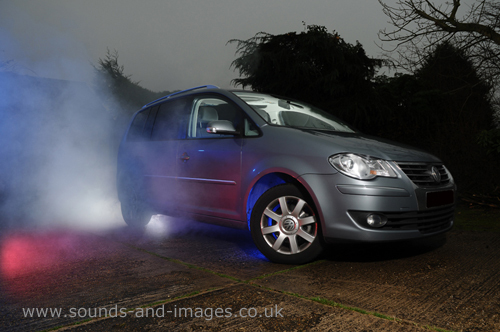 So you want to add some atmosphere to location photo shoots. The usual way of having smoke effects on location means taking a smoke machine and fluid and this needs mains power! So you need to then add a generator to your kit, these are not light and small if you add it to the lightstands and lighting, camera, lenses etc. The ground will be bumpy and uneven with maybe no vehicular access. Well what do you do? 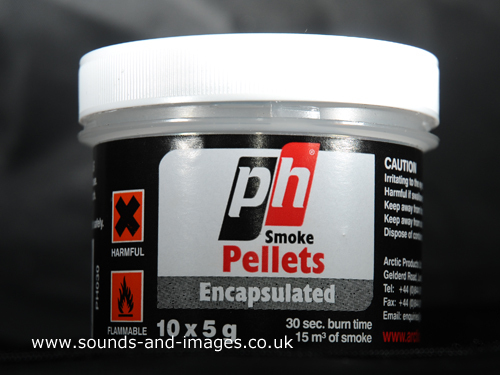 Encapsulated smoke pellets are normally used for testing air flow on boilers etc. Take smoke pellets of course, the kind sold in DIY and trade stores like www.screwfix.com for packs of 10 or 50 pellets. retail outlets across the country or online with postal delivery. I bought a tub of ten encapsulated pellets that burn for 30 seconds and producing 15 cubic metres of smoke. To be honest the encasulated pellets produce a smoke tainted with plastic fumes, so the normal type will be better. The smoke itself is white and needs to be lit either by flash or shooting into the sun. Pellets come in diiferent burn tmes and smoke output. Getting a balance of smoke and burn time for the right effect will need to be a personal test and may vary from shoot to shoot. The largest I have found burn for 90 seconds and produce 300 cubic metres of smoke! An encapsulated pellet out of the tub before lighting. You may not be able to tell from the picture on the right but the pellet’s size is 15mm X 35mm. Don’t forget your lighter though and much easier than trying to use matches. I found it is best to back light the smoke with a flashgun, though this was a little too late in the day and too low on pellets to get properly set for this. 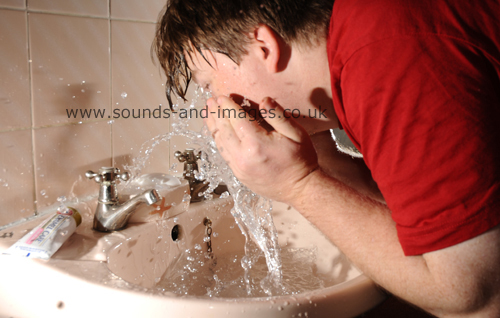 So here are some resulting images from the test shoot. As you can see the added effect is eye catching and adds some considerable interest to the image. Lit by two YN 460MKIIs, placed left of the camera with one the other side of me and triggered with built-in camera flash. So you fancy getting into off camera flash. There are lots of options for this and in this post we will look at a number of items and different setup costs. I already have the Lencarta Safari, this is 600Ws and can either run a studio type head with Bowens S-fit light modifyers and my first flashgun the Jessops 360AFD for Nikon. However I had managed to lose it while on Lanzarote a couple of weeks ago. At the moment a Jessops 360AFD costs £79.00 each. If you look online at the various auction sites you will find alternatives, some of which can be found much cheaper. 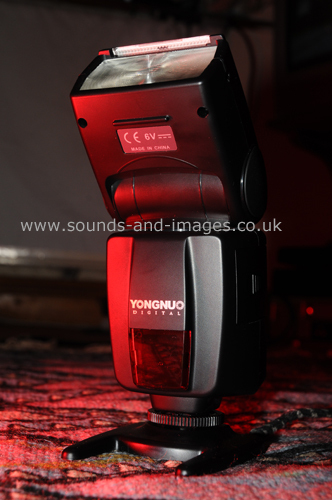 So I went with the Yongnuo 460MKII as it is widely used amongst those into off camera flash or ‘Strobist’ A term created by photographer David Hobby. A link to his blog will be at the bottom of this article. It can be set as manual, Slave 1 or Slave 2. Slave 1 is for use with a master flash in manual. Slave 2 can be used with the master set to TTL. Both the 460 and 460MKII have a power save function. Build quality seems surprisingly good. Solid feeling to the plastics and to the head swivel. A bounce card and diffuser pull out of the head too. One other point is, that most flashguns zoom by moving the flash tube back and forth to control the spread of light at the same focal length as your lens choice. The 460 MKII does not have a zoom head. 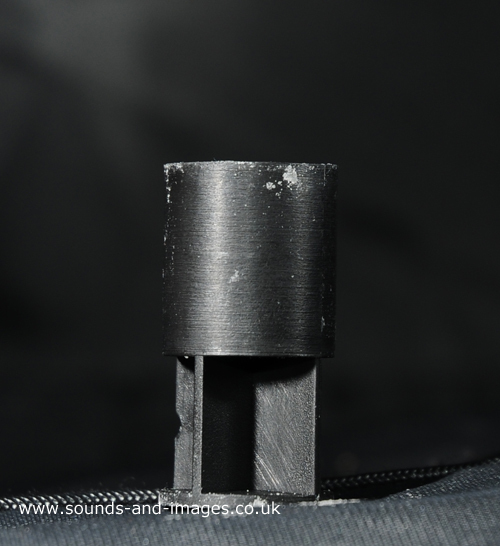 The 460MKII is supplied with a desktop/tripod stand and a cloth bag to protect it. Available for Nikon, Canon, Pentax and Olympus cameras. I paid £39.95 each and bought two, this can be used to light a background and help make one using coloured gels while the main light is coming from the Safari. I can also do interesting things with lighting just from these two flashguns. Other models from Yongnuo include the 462, 465, 467, 468 and 560. Of course you can light a person or foreground interest with one light, sometimes it makes for a more interesting image, soft light from the front, drop the ISO and aperture and increase the shutter to reduce the ambient light. A shoot through umbrella would be a more portable option though, you would lose some control over the light as there will be some bounce from the diffuser. Reflective umbrellas come with a white, silver or gold lining or as a multi purpose umbrella with a removable outer cover to reveal a shoot through etc..
Folding soft boxes can also be bought for use with speed lights and offer more control. You will need a cold shoe spigot with umbrella mount and lightstand to use modfiyers like these with any of the brands of flashgun. With more money there are products from Nissin, Nikon, Sigma, Canon etc. For example price wise the Nikon SB700 is around £280.00 with the SB-900 costing £329.00 and the Canon range from £100.00 to £385.00 each. Here is a slideshow with images lit by the Lencarta safari, some may also include flashguns. You can add radio triggers. Starting at the popular Yongnuo RF-602 which can be purchased for around £80.00 with four receivers. You can also use a receiver and connect it as a wireless remote! Pocket wizards are a lot more money for a set (two) are around £319.00 for the Plus 2s additional units are around the £183.00 mark! What ever your budget there are products for you. Right down to bargain basement online with a bit of browsing, though build quality and lifespan may not keep up with more expensive products.